In an astonishing fact, Pokémon GO has been downloaded more times in one week than the very popular relationship app Tinder has been in the past 4 years and according to some sources, it could surpass Twitter in terms of its daily active users! 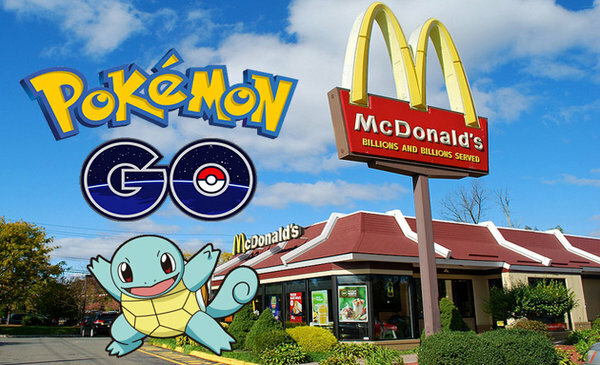 Avid Pokémon GO players uncovered that a McDonald’s logo was hidden in the app data and hours later the Pokémon Company confirmed that there would be a branded tie in with the quick service restaurant (QSR). Some small businesses had already been capitalizing on the global game craze with fun signs or promotions, but this announcement marks the game’s first foray into official brand partnerships. How does getting the attention of these Pokémon crazed smartphone wielders benefit McDonald’s? Early details seem to indicate that all McDonald’s locations in at least one country, rumored to be Japan, will be turned into “PokéStops” or “Pokémon Gyms”, which means players will follow their GPS and congregate at these locations to engage in certain geographically tied in game activities. In How Brands Grow, Byron Sharpe describes how physical availability drives brand growth. Simply put, brands that are more readily available, are more likely to fulfill consumer need states. When it comes to QSRs, brands can increase their physical availability by increasing the number and accessibility of their locations. Providing more reasons to visit their stores or locations creates new consumer entry points. In this case, the game itself will drive traffic to these locations by making them desirable destinations for anyone playing. Given that these consumers will have likely been walking around for hours glued to their phones while playing, the Golden Arch labelled “PokéStop” are likely to trigger and satisfy hunger and thirst need states. It will be interesting to see how the potential washroom lineups impact paying, yet non-playing consumers. A relatable example from Byron Sharpe’s book is how Sainsbury’s in the U.K. demonstrated sales growth over its competitors during the busy Christmas period of 2010 by simply purchasing 12,000 tons of salt and ensuring that their parking lots were always free of snow, making their retail locations more desirable and accessible. In simple terms, the halo effect is the tendency for an impression created in one area or by one brand to influence opinion in another area or for another brand. McDonald’s has had a long standing partnership with Nintendo, previously supporting the company’s DS and 3DS systems with Wi-Fi enabled beacons and having strong brand ties with the Pokémon franchise through promotions and Happy Meal toys. By highlighting this partnership, the positive associations consumers have towards Pokémon GO create a mental halo that McDonald’s can position itself to take advantage of. The partnership may also dial up new associations that further strengthen equity in the brand. McDonald’s is making a bet that this partnership will drive significant traffic and positive associations for the brand. Time will tell whether the game continues to garner the attention that it has so far , but in any event, we applaud McDonald’s for trying new things to build physical availability by making its retail sites more desirable and accessible. It is also a smart brand move to drive additional associations through the halo effect with the excitement surrounding Pokémon GO. If interest in the game and the overall popularity of Pokémon continues to grow, imagine the impact this partnership could have, especially if McDonald’s chooses to leverage its 30,000 global locations.